In cyber-physical systems, malicious and resourceful attackers could penetrate a system through cyber means and cause significant physical damage. Consequently, early detection of such attacks becomes integral towards making these systems resilient to attacks. To achieve this objective, intrusion detection systems (IDS) that are able to detect malicious behavior early enough can be deployed. However, practical IDS are imperfect and sometimes they may produce false alarms even for normal system behavior. Since alarms need to be investigated for any potential damage, a large number of false alarms may increase the operational costs significantly. Thus, IDS need to be configured properly, as oversensitive IDS could detect attacks very early but at the cost of a higher number of false alarms. Similarly, IDS with very low sensitivity could reduce the false alarms while increasing the time to detect the attacks. The configuration of IDS to strike the right balance between time to detecting attacks and the rate of false positives is a challenging task, especially in dynamic environments, in which the damage caused by a successful attack is time-varying. In this paper, using a game-theoretic setup, we study the problem of finding optimal detection thresholds for anomaly-based detectors implemented in dynamical systems in the face of strategic attacks. 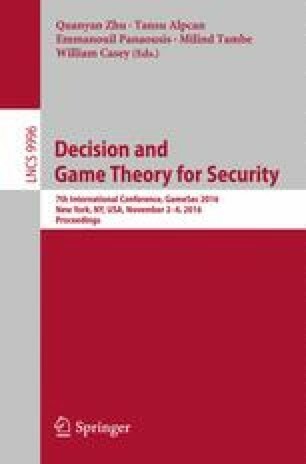 We formulate the problem as an attacker-defender security game, and determine thresholds for the detector to achieve an optimal trade-off between the detection delay and the false positive rates. In this direction, we first provide an algorithm that computes an optimal fixed threshold that remains fixed throughout. Second, we allow the detector’s threshold to change with time to further minimize the defender’s loss, and we provide a polynomial-time algorithm to compute time-varying thresholds, which we call adaptive thresholds. Finally, we numerically evaluate our results using a water-distribution network as a case study. This work is supported in part by the the National Science Foundation (CNS-1238959), Air Force Research Laboratory (FA 8750-14-2-0180), National Institute of Standards and Technology (70NANB15H263), Office of Naval Research (N00014-15-1-2621), and by Army Research Office (W911NF-16-1-0069).